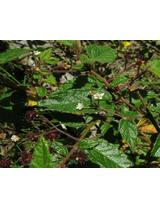 Description: Shrub 1–4 m high, often flowering young so as to appear as a subshrub. Leaves ovate to lanceolate, mostly 3–7 cm long, 5–30 mm wide, base slightly cordate, margins coarsely toothed, sometimes lobed; upper surface pubescent but usually becoming glabrous or scabrous and wrinkled with impressed veins, lower surface velvety-pubescent; petiole mostly 5–10 mm long. 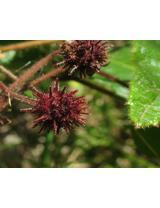 Juvenile leaves often 3–5-lobed, to 10 cm long, 6 cm wide, ± golden velvety to pubescent with long stellate hairs. Inflorescence cymes, few-flowered, longer than petioles. Calyx c. 2 mm long. Petals 2–3 mm long, pinkish. Capsule 5–7 mm diam., bristles rigid, 2–3 mm long. Fruits summer. 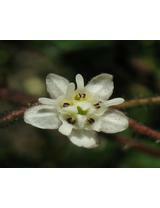 Often grows in rocky sites, especially along gullies and streams.